RealWood Depot was founded by hardwood suppliers out of the need for hardwood product surety in the market place. RealWood Depot provides this by certifying authenticity of species and and lumber quality without increasing product costs. While researching sustainable availability of premium hardwood in the late 90’s, the founders of RealWood Depot discovered many inconsistencies of hardwood quality, availability and professional milling. There were many species misnamed and sold as higher priced lumber. Many were poorly graded or poorly milled and only occasionally available. These factors prompted the creation of RealWood Depot, which is a group of suppliers dedicated to the key factors, which create surety for hardwood products in the marketplace – Species identification, Quality, Availability, Sustainability and Certification. Species Identification is simply the verification that the buyer is getting what he pays for. This seems obvious but it is common to see species represented and sold as more expensive species in the market place. For example, we’ve seen cumaru, tatajuba and even tigerwood sold as ipe’. The list of misrepresentations gets longer as the less well-known species are researched. Beyond the usual notations of grain, color and mechanical properties, RealWood Depot matches the common names, scientific name, location of origin and originating country’s documentation to ensure the correct representation of each shipment. This method of identification ensures true identification. Quality of grade and quality of milling are important factors for appearance and functional use for premium hardwoods. North, South and Central American countries have a variety of grades between species with conforming and non-conforming standards. This is largely due to the range of experience and formal training between different graders. 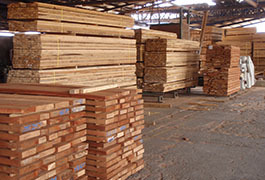 RealWood Depot inspects its lumber throughout the production process from logging to shipping to ensure that only the highest grade correctly milled lumber wears the RealWood™ tag. Availability is a large contributing factor to what lumber vendors will sell. The adage, “sell what you have”, is rule #1. RealWood Depot provides a consistent supply of premium hard wood decking so that lumber sellers have the best product available. Some suppliers do not supply premium hardwood lumber as a regular course of business but rather purchase small quantities for sporadic demands. This leads to unreliable supplies with dubious quality and little or no technical support. RealWood Depot’s reliable quality enables contractors and home owners to buy with confidence. Sustainability of hardwood species is not only environmentally responsible but also business smart. Marketing a beautiful product to have that product supply diminish is simply not good for business. Many of the family owned mills that have been producing hardwood lumber products around the globe know this and have been logging responsibly for decades. The International CITIES Treaty has done much to further the awareness of this subject also. Many countries like The United States, Brazil, Nicaragua, Costa Rica, Chile, Guatemala, Guyana and Panama have strict rules crafted from the guidelines in this Treaty that protect forests against illicit and irresponsible logging and milling. We all must use nature’s resources responsibly to ensure their survival for centuries to come. 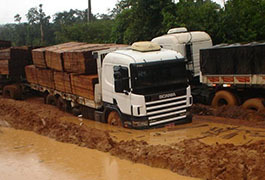 Land clearing is an unintended consequence of the world's recent demand for alternative fuel (Time Mar 27,2008 The Clean Energy Scam). Using hardwoods directly promotes sustainability of forests while using manmade (oil based) alternatives like plastic decking negatively affects forests by increasing the demand for oil, ethanol and ethanol producing soybean fields. This protection and promotion of Hardwoods helps protect valuable forests that might otherwise be stripped of ALL trees so that soybean fields can be planted for ethanol production. RealWood Depot’s practice of supplying alternative hardwood choices helps the sustainability of all species by disbursing the demand for hardwood over more species that regenerate quickly. These alternative species are just as beautiful and durable as better known species. 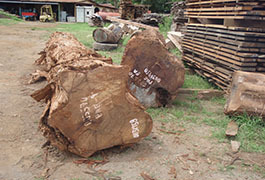 RealWood Depot also works to harvest trees downed by natural disasters before promoting the harvest of living trees. The utilization of trees downed by Hurricane Felix at the end of 2007 stimulates the economy and provides jobs, clears millions of acres of debris that would otherwise strangle local transport efforts and funds the replanting of many millions of young trees. RealWood Depot and their affiliates strive to supply premium genuine hard wood decking and siding responsibly and with the assurance that you’re buying the real thing. Buy “RealWood Certified” hardwood. Always look for the RealWood tag. RealWood Depot provides hardwood product surety in the marketplace by certifying authenticity of species and and lumber quality without increasing product costs. RealWood Depot is a group of suppliers dedicated to the key factors, which create surety for hardwood products in the marketplace: Species identification, Quality, Availability, Sustainability and Certification. © 2013 RealWood Depot, All rights reserved. Site design and maintenacne by HammerHead Design, Inc.